Richly steeped in history and culture, the Yu Zhang Shu Yuan, or the Guizhou Cultural Heritage Institute, focuses on the study of, preservation and continuance of Chinese philosophical and traditional heritage. Shu Yuan, meaning a courtyard for reading and studying, originated during the Han Dynasty, more than one thousand years ago. Originating in Jiangxi Province, the first Shu Yuan was located in an area spread rich with the Yu Zhang tree, thus the source of its name. 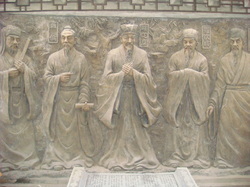 By the Qin Dynasty, there were four major Shu Yuan across China located in Jiangxi, Guangdong, Fujian, and east Guizhou. All of them were heavily influenced by the Luo family. In 2002, Mr. Luo, a descendant of this family, transferred the Shu Yuan from east Guizhou to Yangchang Village near Guiyang and resumed operation. Today, Guizhou Yu Zhang Shu Yuan is the only one that is operational in China. Today, Yu Zhang Shu Yuan’s sole purpose is the resurfacing and passing down of Chinese cultural heritage, especially that of Confucianism, Buddhism and Taoism, and the histories of significant folk legends and heroes rooted and traditionally passed on throughout the rural areas. The Institute’s facilities include traditional architecture surrounding a garden courtyard, and surrounded by farm and orchards. It is a study center that can also provide lodging and meals to its students. NatureWize conducts many of its nature activities at or near the Institute, not only due to its natural surroundings but also for its common values to promote more harmonious living, rooted deeply in the Chinese cultural heritage it wishes to pass along to future generations. For more information, visit their website here. Click here for directions. Yu Zhang Shu Yuan has partnered with NatureWize to allow NatureWize families to participate in their Spring of Life Rural Experience Project. This Project will include creating an experiential agricultural museum displaying the rich heritage of Chinese agricultural traditions. NatureWize families can participate by farming 8 plots of the demonstration farm area. In March (2012), we’ll open the project by helping Yu Zhang Shu Yuan break the ground for the plots! Then, participating families may assist in all stages of growth, from preparing the soil and planting the seeds, to witnessing growth, and the eventual harvesting of the produce. Registration for participating in the project will begin during the March 11 event!